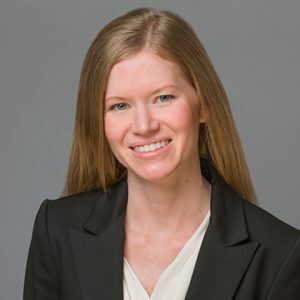 Kimberly Fisher is an intellectual property attorney whose practice includes all aspects of intellectual property law, including patent, trademark, copyright, and trade secret matters. Kimberly also assists clients in litigation and enforcement matters. She is committed to helping clients accomplish their goals and protecting their intellectual property now and in the future. She supports clients in a broad range of technology from our Portland office. Prior to attending law school, Kimberly worked as research associate at a biotechnology company helping to develop innovative flavor enhancers using proprietary assay systems and robotic liquid handlers, with a focus on the chemistry product development, which included high-throughput screening and optimization of key compounds. During law school, she clerked for a criminal defense attorney where she assisted in complex federal cases. Haley, Kathleen, and Kimberly Fisher. “State Medical Boards Self-Examination: Analysis of Oregon Data 2009-2012.” Journal of Medical Regulation 101.2 (2015): 35-38.